Shindong shimshimtapa is a radio program hosted by Shindong from Super Junior on MBC Radio that aired everyday from 00.55-0200 AM. Juniel is a special guest of this corner “This(Diss(?) is Hip Hop”, joined by the regular guest Sleepy(Untouchable) and 5zic(M.I.B). 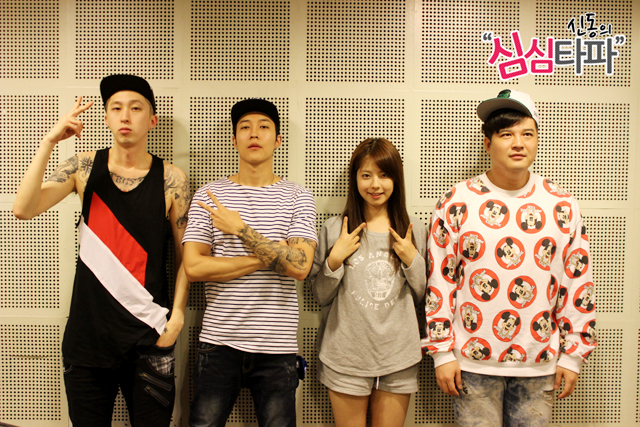 Shindong: A pretty girl who can do witty talk, can sing well and have loyalty to MBC radio…Special guest Juniel ! Sleepy: What a sad rap. 5zic: Really, have no activities except radio. Shindong: What have you been doing, on radio, you are on starry night right? Juniel : Yes, starry night, also with ryeowook oppa. Shindong: Sukira… which one is funner? Starry night or sukira?. Juniel: Both of them are really interesting.Shindong : If you can only pick one, since they are one the same time right? this is mbc..(starry night), ryeowook is my fellow member. Juniel: I met sleepy many times, because he taught AOA jimin rap, so i bump into him from time to time. Because 5zic and Juniel won the 1st rap battle, 5zic request Juniel’s illa illa to be played.